One of the greatest interior architects and textile designers of the 20th century, Alexander Girard envisioned a world of abstract forms and graphic motifs in vibrant colors. The 849 Alexander Girard Pen by Caran D'Ache is a trustworthy everyday companion inspired by his iconic patterns and motifs. 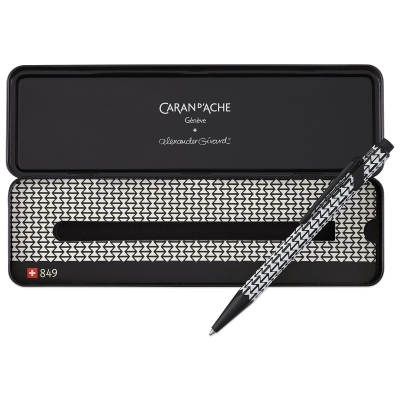 Available in two designs, the 849 Alexander Girard Ballpoint Pen is made from lightweight aluminum and features a hexagonal shape for a unique handling and writing experience. 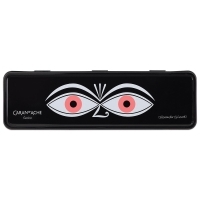 Every pen comes in a metal case adorned with Girard's iconic "The Eyes" motif. 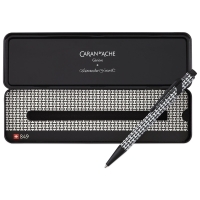 Caran D'Ache 849 pens are designed and manufactured in the Caran d’Ache workshops with the greatest care, in line with the standards of the Swiss Made label. 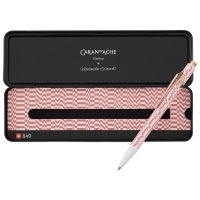 Pink — This pen features a "Check Stripes" design in pink on a white gloss body, with a rose gold-plated clip. Black — This pen sports a geometric "Double Triangle" pattern in white gloss on a matte black body, with a matte black, chrome-plated clip. 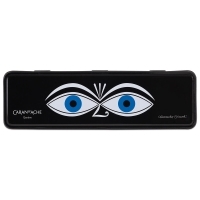 ® Caran d'Ache is a registered trademark.® Alexander Girard is a registered trademark.